Nellie Irene Winney passed away February 6, 2016 at Dungeness Courte in Sequim, Washington. Nellie was born December 7, 1915 in Dalhart, Texas to Sidney and Sallie (Gallett) Mitchell, joining siblings Charles, Pauline and Lena Mae. While attending Dalhart High School she played on the Coca Cola Queens basketball team traveling to other small towns. At five-feet- one she must have been a flash. There was never any Pepsi in our house. In 1934 Nellie married Horace R. Winney in Dalhart where they had three children, Sid Ray, Curtis, and Patsinell. Sid Ray was lost to appendicitis at the age of three. After moving west, two more children were added to the family. Joe was born in Bremerton, WA and Ray was born in Portland, OR. In 1946 the family settled on Bainbridge Island. After the passing of her father in 1946, Horace traveled back to Dalhart for Nellie's two horses--no small feat with an eighty-five horsepower vehicle. Soon after, Horace and Nellie and four fellow horsemen formed the Bainbridge Island Saddle Club, which is active to this day. was a 'good worker.' She was the hardest worker among them. She talked the train engineers into stopping the train so "Nellie" could herd her cows across the tracks. She made wooden shoes during WWII in Oregon. She worked at a drive-in restaurant on Bainbridge Island and clerked in the local department store in Winslow. She grew zucchinis for sale after Horace died on the farm, which was now 19 acres. She came out of retirement at age 73 to work at Bainbridge Gardens Nursery before retiring again. Horace and Nellie always raised a few head of cattle, some pigs, rabbits, chickens, a huge vegetable garden, and fruit and nut trees. In the late seventies her oldest son, Curtis, gave them a gift of four buffalos. While caring for her ill husband at home, one buffalo got out of the pasture. After some conversation, Nellie had to chase the bull back through the gate with the aid of a broom. In later years at assisted living facilities caregivers learned they were caring for a woman who was determined and quite unique. 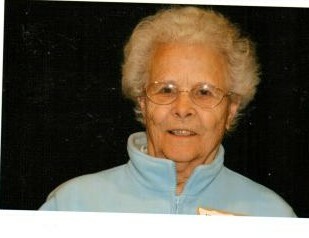 As her Alzheimer's progressed it was necessary to move to an assisted living facility in Port Angeles. She was fortunate to find a couple who wanted to purchase her property and maintain it as a 'sustainable' farm. Heyday Farm, as it is now known, continues to operate and hosts children from various elementary schools in projects where they get dirty and raise vegetables in garden areas provided for them. Nellie is survived by her four children, Curtis (Judy) Winney, Forks, WA; Patsinell (Pete) Skartvedt, Ballard, WA; Joe (Cheryl) Winney, Port Angeles, WA; Ray (Pam) Winney, Forks, WA ; and two nieces in Portland, OR. She is also survived by grandchildren, great-grandchildren and great-great grandchildren. She was pre-deceased by her husband in 1980, parents, all three siblings, and son, Sid Ray. At her request part of her ashes will be buried next to her husband on Bainbridge Island and on the family plot in Dalhart, Texas, next to her son and parents . Nellie was truly a unique person and will be missed by all who loved her. The family would like to thank the caregivers at Laurel Place Assisted Living in Port Angeles and Dungeness Courte in Sequim for their loving care and compassion.